Oh dear, Everton. You’ve been going up near that top 4 where you’re not allowed again, haven’t you? Naughty. Yes, we’ve come to a point in English football where various media moguls have put their heads together and decided on a top 4 to dedicate focus to. Anyone who upsets the focus deserves the full tabloid wrath. Hang on, who make up the Big Four? Chelsea, Man City, er, Arsenal? Man Utd? Liverpool? Spurs? Can’t be Everton, they don’t spend £100m. They can’t quantify our success. Simple. Man City spend hundreds of millions and win the league. Chelsea ditto. Liverpool buy bad players and are bad. Liverpool buy good players and are good. Arsenal refuse to buy anyone dubiously dubbed “world class”, so they’re specialists in failure. Oh, they did what now? Özil? Better make sure he’s made to look like a flop. That’ll teach them. For some reason Everton keep annoying journalists. Fans of many clubs enjoy our football, pundits are raving over our manager. But you give a man a column in the Daily Mail and you hand him a dangerous tool. In 2004/5 we did brilliantly but at the end of the day we were awful one season wonders because we didn’t score enough goals. In 2013/14 we are doing a cracking job but we are awful one season wonders because we loan players in. With the help of a few avid Tweeters, I’ve got a list of loans. Espen Baardsen, Anthony Gardner, Li Tie, Li Weifeng, Manuel Fernandes, Jô, Denis Stracqualursi, Matteo Ferrari, Segundo Castillo, Franny Jeffers, Tommy Gravesen, Sander Westerveld, Brian McBride, Philippe Senderos, Landon Donovan, Royston Drenthe, Eric Dier. Apparently there was a lad called Ibrahim Said who didn’t play a game for us. Tim Howard and Steven Pienaar were on loan before we signed them on a permanent deal. In fact, that happened for Pienaar twice. What have that lot got in common, then? Not that much. Donovan and McBride did well, Stracqualursi put a shift in, Manuel Fernandes scored a good goal, as did Castillo. Segundo saved us some cash in the shorts fabric department while Jô gave us a good laugh every now and again. None of these loans coincided with us playing great football and finishing in the top 4 – except Mikel Arteta in 2004/5, but he joined permanently that summer. None of them came from “big clubs” with bags of potential. That’s the difference. Somehow it is only now that the loan system is terrible. Romelu Lukaku and Gerard Deulofeu have matured hugely as individuals and footballers, yet the focus is on José Mourinho inflicting Lukaku on the league in another team’s shirt. That’s a bit bizarre. Mourinho hasn’t set Lukaku’s tactics, isn’t working with him every day, and hasn’t put out the ten other players who have laid on his 14 goals. The same can be said of the 17 he scored for West Brom. And why should they moan? Is it our fault that we can’t spend £35m, £42m or £50m on one player? Or that we can’t build a whole squad from the ground without selling a player or two? That’s capitalism, isn’t it. A bit of an irony that this moaning about scrounging when there’s so much top-tier hypocrisy and self-indulgence is most vocal during times of Tory government. The temporary nature of these deals only harms us. We’ll have to let them go, of course. And that’s the point when lazy, lazy imbeciles spout nonsense about us suddenly falling away. The loan players have made up 16% of our starting appearances and contributed 21 of our 68 goals this season. Yes, that’s a significant chunk, but when you use a loan player as a lone striker (don’t think I didn’t notice the opportunity of a needless pun there) that’s a given. The system brings about success, and frankly we should be allowed to use any tools we can afford. But this article isn’t about loans. No, honestly. I got carried away. What this is about is working out if there is a glass ceiling, a place we cannot progress past. Consensus suggests that 4th is our lot. Yet a year ago today it would’ve been said that 6th is our lot. What it comes down to is the ambition of the manager. And ours has bagfuls. Let’s put it this way – is there any team in the league that we cannot beat? The answer is no; each team can be beaten. The real trick is doing it consistently, being ruthless against – forgive me – smaller clubs, and not bottling it when the big boys come ‘a knockin’. Therefore we’re up for the league, right? This is possibly a step too far. A quick look at the squad shows that we have a serious lack of depth. As good as Garbutt, Browning and McAleny could well become, they are not the substitutes a manager with title-winning aspirations turns to. In this day and age players with exceptional calibre are needed too. Yaya Touré, Luis Suárez and Eden Hazard are pivotal. There are no one-man teams, but when only one man could fill a role for Man Utd in 2012/13, it was perfect for them that Robin van Persie was there. This year we have Lukaku. Next year… can we get him back? Possibly. The answer is of course money. Investment. Disposable income. It makes the league go round, except for this plucky bunch who seem to fly in the face of spending. Yet there is always a point where money propels a team to the next level. Roberto Martínez claims that the money is there this summer to bring in six players if a place in European competition is confirmed. That will be absolutely vital. The 2005/6 season is a reminder of the perils of straddling competitions – and bear in mind that we lasted just four games in Europe that year. It is a challenge for a large and talented squad, not that there aren’t exceptions. Here’s the kicker – our own boss states that money is merely the catalyst, the performance enhancer if you will. Time heals all wounds and apparently can make teams boss too. If you had to make an algorithm – y’know, some bored Oxbridge professor could be reading this (salutations my dear fellow) – managerial quality has to be factored in with time, investment and the quality of players as variables. In my mind a great manager is the only one who can bring consistent success. Brian Clough was able to turn Derby from Division 2 strugglers into Champions of England in five years. The quality of the squad was good, the investment was not the best, but the club had a manager (and assistant manager, it must be said) who knew how to beat every team before them. Times change, sure. But don’t we have the same formula? 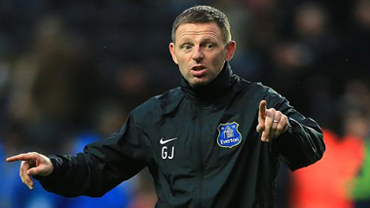 Don’t write Graeme Jones off just yet. I’m not saying we’re going to win the league. Even saying there’s a possibility will see me derided for being a bitter, deluded blues***e, etc. “Small club” nonsense. But there’s always the possibility of breaking that status quo at the top of the Premier League. – it has been done before Derby weren’t world beaters. Blackburn weren’t huge, and neither were Newcastle. The first two managed to win the league; the third one’s Newcastle, so you know what happened. They accelerated their own rise to the top with quick investment, but the same theory is in place. Loan signings come and go, sure. But there’s a good core to this squad, one which has developed a clear, attacking brand of football. 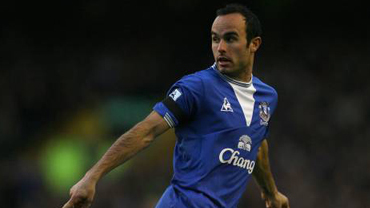 Roberto Martínez is a visionary and has caught out a number of managers already. There’s a successful system already in place. 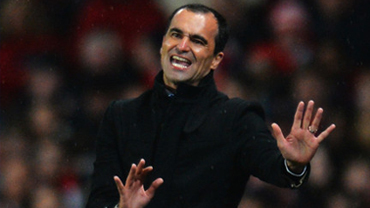 But what happens when the gloss fades and the Roberto Martínez effect is plain to see? It’s happening to Arsène Wenger now. He taught the world how to play successful, winning football and make players athletes off it. But the rest of the world learned, and now he sits stubbornly in his caterpillar get-up watching teams like Swansea and Southampton playing not just the football he taught, but the tactical evolution Barcelona provided. In football the great tacticians have to innovate, to think of something that other bosses haven’t thought of. Wenger has tried the throwback tactic in having the large, weighty Olivier Giroud as pivot with a number of technically oriented players around him. It’s not working. Roberto Martínez’s real skill comes on a personal level. He can get the best out of every player by watching carefully what their key assets are and building them up. Hence every Everton player has become an asset. There is no dead wood and every player is playing in a position they are comfortable in, which maximises their efficiency, to put a Harvard Business School spin on it. On a managerial level, he can look at his opposite number and see the faults in their system. When he comes up against a like mind such as Brendan Rodgers, they tend to cancel each other out – hence why Rodgers’ Liverpool and Laudrup’s Swansea were always very closely matched. For one 0-0 between the two it honestly resembled some Matrix-like scenario with twin Rodgers’ performing identical attack moves on each other. If Martínez can continue innovating and making it tough for other managers to figure him out, he will bring the success. Frankly that skill is something Martínez and Rodgers share and will continue to implement, which is why it is likely Merseyside could dominate the football horizons in the near future. But the only proof, as they say, is in the pudding. Lazy journalists and embittered rivals can write us off, we can vehemently fight back and claim the glory days are returning. What’s great about football is that every squabble, written word and tribal chest-bang can be settled on that patch of grass over ninety minutes. If you can keep your head when all about you are losing theirs and blaming it on you… yours is the Earth and everything that’s in it. And what’s more, you’ll probably pick up a trophy or two, my son. Its so annoying watching the Liverpool media love in as well as the drivel being wrote about us. But as the author rightly said it can all be sorted on the pitch. Great read. I’ll be made up if we smash through Moyes’ perceived ceiling and make it into the CL next season. Of course it all depends upon whether Bill and his cronies use the cash to fund ‘operating costs’ or whether it goes to strengthen the team!! !